Pricing: Please contact me for prices. Taylor Douglas is a skilled musician and performer, and has spent most of his life devoted to the pursuit of musical excellence. Hailing from Melbourne Australia, Taylor has flourished providing a solid backbone through drums and percussion to some of the thriving Melbourne music scenes best acts, including his with (but by no means limited to): The Soulenikoes, Caution:Thieves and Past to Present. His adept composition and performance in these bands drew the attention of others, and he soon found himself clocking on as backline for internationally renowned act Bellusira, as well as the D2 Drumline, which saw him perform on a national televised stage at the Cricket World Cup at the MCG, and as part of the NRL Finals at AAMI Park. Also an accomplished and accredited instructional teacher, Taylor has ten years teaching experience all across Melbourne and Geelong. Priding himself on his abilities, patience and enthusiasm for his discipline, Taylor’s teaching efforts have been rewarded with great rapport with his past and present students, and has seen him coach some all the way to selection for Top Class for High Performance in VCE Music (solo). Taylor’s extensive credentials include a Bachelor of Music (Monash University) and a Graduate Diploma from ACU. He has studied under several proficient teachers and drummers including Graham Morgan, Tony Floyd, Dave Beck, Danny Farrugia, Gerry Pantazis, Lucius Borich (COG), Andy Gander & Gordon Rytmeister. In further pursuit of his passion, Taylor travelled to the USA & Cuba to study with America’s own titans of drumming, Dave Elitch (The Mars Volta), Daniel Glass (The Royal Crown Review), Steve Hass (Patti Austin), Tommy Igoe (Birdland Big Band), Stanton Moore (Galactic), Rodney Barreto (Chucho Valdez) and Ari Hoenig (Punk Bop; Ari Hoenig Trio). Few players have the deft ability to take you through a dynamic journey through percussion alone, but Taylor is one such artist. From a laid back swing groove through to the chaotic yet rhythmic tumble of an erratic washing machine meeting a thunderstorm, he can run the gauntlet from quietly menacing through to an open assault – and all while looking like a kid on Christmas day opening the shiny new red bike. It is obvious to all who have seen him play that Taylor’s home is behind his kit. 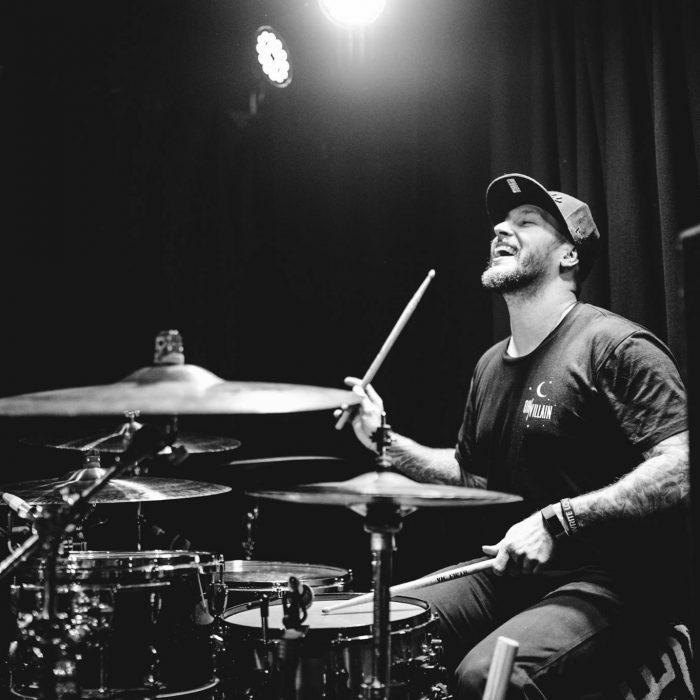 When not at his drum stool, Taylor can probably be found unloading or reloading his car, or sharing his home with his beautiful family; his lovely partner Lauren, party puppy Alle, and he is the proud father of 37 beautiful snare drums. Lessons are taught in a one-on-one fashion and are designed around the students’ goals and interests. Materials vary from printed hand outs to videos and digital resources, whatever we need to get you playing we will use! My goals as a teacher are to make the lessons challenging yet enjoyable, relevant to what you want to do with your drumming and enable you to feel comfortable and supported during your lesson time. I also encourage students to take videos of their lesson material with their phone/tablet to review during the week, or contact me with any challenges so I can help them out. You can also expect lots of enthusiasm and terrible jokes from me! My home studio is acoustically treated and features two acoustic kits, internet access and a variety of resources, both digital and physical. Exams of all types are catered for (AMEB, Trinity, VCE performance solo/group, VET music).